Perfect for all of your kitchen's heavy duty serving and cooking needs, this Vollrath Jacob's Pride 47147 #40 lavender disher provides accurate 1 2/3 tbs. portions of hot or cold foods in your restaurant, cafeteria, or bakery! The color-coded handle helps ensure easy size identification when selecting your desired serving amount of mashed potatoes, steamed vegetables, yogurt, cookie dough, and other soft foods. Great Design, handle is comfortable and the mechanism is sturdy but not a strain to use. Perfect size for cookies, not bite size but not too big. They clean up very easy. We use these to scoop our whipped butter into 2oz portion cups to serve with our house bread. They’ve held up well to daily use. It is so durable, even for scooping hard cookie dough that’s been refrigerated. Releasing the dough is great. It doesn’t feel like it’s going to fall apart like my old one with hard cookie dough. The size is absolutely perfect for cookies. I imagine this lasting for a very long time. Highly recommend for others looking for the perfect cookie scooper. I really like the robustness of the Jacob's Pride dishers for scooping stiff things like refrigerated cookie dough. I use either the #40 or the #30, depending on the cookie. Love these scoops! Have numerous sizes. This is the one I use second to most due to the size. Don’t have any issues with them rusting, either. Easy to clean and easy to use! These are perfect for baking cookies. I purchased this for my own kitchen use and it is very well made. Great price and great item! 5 Stars! Purchased for use in a commercial bakery. These hold up very well to repeated daily use and abuse. They are used heavily and continue to work with no issues. Nice quality, scoops as it should. Would be nice if there was left handed version, but for a right handed scoop, it works well and is durable. These 0.75 oz Lavender Dishers work so well behind our bar. We use these to scoop peanut butter into our spiked milkshakes. Peanut butter comes out easily. If you watched cooking shows or videos of professional chefs, you will see them use dishers. Having never used one before, we could see that it would be nice to have for cookie dough. If you watched Alton Brown's show, you know he has a drawer dedicated to dishers. So we order a couple of the smaller sizes. We had no idea how great it was to have these. Such a time saver. We now have a complete set. Then we bought the essential sizes for my daughter, and finally we have been giving complete sets as wedding gifts (along with other little known kitchen essentials). Nice and sturdy. This is the perfect size for cookies -- I think some people here must make enormous cookies, but for me, this is just right. The strong, all-metal construction of the moving parts shows that this tool is built to last and will hold up for years, unlike cheaper versions that eventually and inevitably fall apart. I love these dishers. The color coding makes it extremely easy to find the size you need. The dishers are easy to clean as well. Cookies bake up in a jiff. This is an Awesome Disher scoop. Besides being Vollrath Jacobs Pride and the quality that goes behind it, these are great for my smaller size cookies. Try It! Experiment and see what works for you. I own the whole line. I use them for portion control in serving and baking. No more guessing when you use these scoops. Consistency every time. You can't beat the prices and quality of what you get when you shop Vollrath and Webstaurant Store. Seriously. Note: These are disher scoops not really made for hard hard ice cream. The Vollrath Jacob's Pride 0.75 oz. 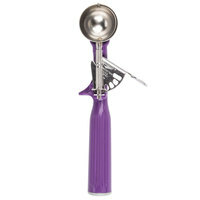 Lavender #40 Disher has a vibrant purple handle that can easily be spotted if misplaced. Vollrath provides another great product at a great price through Webstaurant! This is a great quality product at a more than reasonable price. fantastic quality, great product and best of all - color coded. we use these in heavy rotation and they haven't died on us yet. highly recommend this brand! We use these scoops every day and they hold up well to the work load we put on them. They scoop and portion cleanly every time! I've purchased a few different sizes of these now. They're great quality, and hold up well in a rough environment. I use the 0.75 oz for meatballs, but you have to really cram that meat in there for it to stay together. I've also found it useful to not sweep the entire way for meatballs. This is a really nice little disher. We use it to portion out our sour cream into our soufflé cups. It works perfect for that. Purchased a similar "disher" at a nearby specialty cooking store for double the price and within a couple of uses it was falling apart. After that disaster purchase I purchased most of the Vollrath Jacob's Price dishers (several sizes available) and haven't looked back. They work every time and don't fall apart. They are designed for heavy volume kitchens and can take a beating. I currently use the 0.75 oz size for portioning out cookie dough. If you want professional looking cookies that are consistent in size, then this is the product for you. Skip the more expensive versions at the specialty cooking stores! This was perfect for the melon I used it for. I love the lever to get the food out. These are great for portion control as well. They are color coded for capacity. Easy for quick locating what level of measurement is needed. I love this scoop!! I use this for all my cookies and for icing and ice cream as well. I also like to buy it as a gift for people because it's so handy and much more durable than what you can buy through other retailers. I've had mine for around 5 years with no problems! This is the only scoop I use for portioning out my cupcake batter for my MINI cupcakes. They come out the same size and perfect every time! After searching for a portion scoop that wouldn't rust and break, I finally decided to buy a commercial tool. I bought two sizes of the Vollrath scoops. This was a great choice and I have been more than happy with the performance of this scoop. Even as a left-hander, I find this scoop easy to use (have to use middle finger in the left hand) and it remains comfortable after extended use. Overall I am very satisfied with this product, would buy again. These are perfect size when we form our truffles. They are easy and pretty sturdy. We bought three and out of that 2 are still working very well- would recommend. These things last forever! I bought a few a few years back and now need more, not because they are getting bad, just more business. Love these items. This Vollrath disher works great for cookies as it provides a good sized cookie. Very fast and easy to use. Also easy to clean after the job is done. Best quality scoop I have ever used! Great for cookies, meatballs, cupcake batter, etc. These scoops will last longer than me! Every kitchen should have these in various sizes. I can't live without Vollrath dishers. I used to buy the cheap ones in baking supply sections at craft stores, only to have the metal blade bend with use. A true workhorse, this scoop stands up well to stiff cookie dough and cleans up nicely in the dishwasher. The .75 oz. scoop is the perfect size for mini muffins and cupcakes. It's so much cleaner to use and gives a consistent muffin/cupcake each time! This disher makes what I consider to be the perfect sized meatballs. My husband isn't quite as savvy in the kitchen but loves to make beer braised meatballs. He always complains that his meatballs are never as "pretty" as mine, so I tell him to use the purple scoop and he now produces the uniform results he desires. I also use this disher at work for scooping coconut macaroons, which makes a nice sized cookie that we dip the bottom in chocolate. Purchased this size dishes for sour cream and butter on baked potatoes. We like this size as it is small and keeps a 1 oz. portion under control as the staff tends to overscoop. Perfect size portion scoop for cookies. I also have a black handled portion scoop and I bought this one because it is a little bit smaller for the more rich cookies that I like to make. Its sturdy and washes up just fine in the dishwasher. When I leave reviews for a cookie recipe on recipe websites I always mention that a commercial quality portion scoop is great for making even sized cookies. You could also use this as a melon baller. I really do love Vollrath dishers. They make portion control a breeze. The "purple scoop" is 3/4 oz. and is the perfect size for mini muffins, cupcakes and cookies. Every kitchen should have a few of these. Highly recommended! These serve so many function in our kitchen. You can portion smaller batch items of or use for small scoops of Ice cream. Great size for truffles. If you're looking to make a bunch of meatballs, this is the disher for you! Makes nice uniform Italian meatballs, about 1 ounce. Buying all the sizes. Perfect for cookie dough scooping. Cookies always are the same size when using this scoop. Sturdy with no plastic parts to break or wear out. This size is a baking essential. For years we portioned out meatballs with a spoon and rolled them in our hands. This disher makes a great meatball. By putting one glove on, the excess can be smoothed off. 100 meatballs can be made very quickly! The Vollorath #40 disher is quality made, well worth the price and is the perfect size for making cookies or dropping perfect size hushpuppies into the fryer. This disher is the perfect size for making small cookies or for forming cake pop. Very comfortable to hold and has a smooth scoop mechanism. Really good quality disher. It's the perfect size for meatballs, hushpuppies and even smaller cookies. Heavy duty construction and it's heavier than similar ones I've seen in the kitchen shops. This is an excellent color-coded lavender disher that is made by Vollrath. All moving parts work smooth and you feel that this disher is well-made when you use it. I personally use it to scoop and portion the tuna salad for the sandwich rolls.